Q1. In Fig. 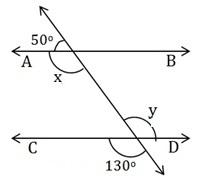 6.28, find the values of x and y and then show that AB || CD. Q2. In Fig. 6.29, if AB || CD, CD || EF and y : z = 3 : 7, find x.
Q4. In Fig. 6.31, if PQ || ST, ∠ PQR = 110° and ∠ RST = 130°, find ∠ QRS. 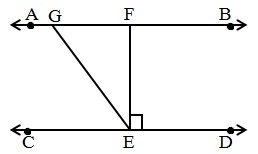 Construction: Draw PQ || XY from point R.
PQ || XY .................(2) By construction. ST || XY and SR is a transversal. Q5. In Fig. 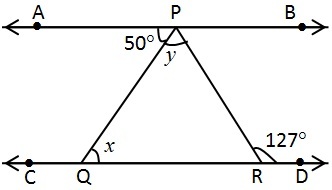 6.32, if AB || CD, ∠ APQ = 50° and ∠ PRD = 127°, find x and y.
AB || CD and PQ is a transversal. Q6. In Fig. 6.33, PQ and RS are two mirrors placed parallel to each other. An incident ray AB strikes the mirror PQ at B, the reflected ray moves along the path BC and strikes the mirror RS at C and again reflects back along CD. Prove that AB || CD. 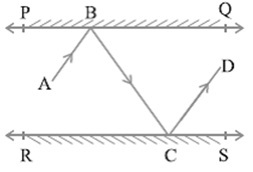 Given: PQ || RS and AB is incident ray, CD is reflected ray. 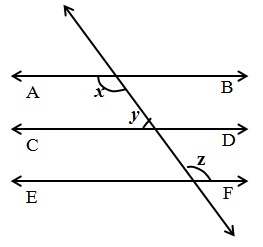 Angle of incidence = Angle of reflection, where BM and CN are normal.